Sprint darling Briana Williams walked away with the Austin Sealy award as Jamaica ended the 47th staging of the Flow Carifta Games in fine style yesterday with male team captain Christopher Taylor anchoring the Under-20 4×400 metres relay team to victory in 3:06.62 to end another successful championships for the country’s young athletes. The country picked up 32 medals on yesterday’s final day -17 gold, 12 silver and 3 bronze, ending with 84 medals overall – 45 gold, 29 silver and 10 bronze . Williams, who played a role in three of those gold medals – the Under-17 girls’ 100m, 200m and 4x100m – was named the most outstanding athlete of the three-day championships, which took place at the Thomas A Robinson Stadium in Nassau, Bahamas. The Jamaicans actually swept the 4x400m relays, as they did in the sprint hurdles and 200 metres earlier in the day. Crystal Morrison of St Jago set the stage in the first track final on the day, the girls’ under-17 100m hurdles, winning the event in 13.11 seconds to break Melaine Walker’s 1999 record of 13.51. Ackera Nugent finished second in 13.35 seconds to secure the top two podium spots for Jamaica. Amoi Brown successfully defended her title in the girls’ Under-20 100m hurdles, winning in fantastic style, as she sped to a new mark of 13.15 seconds to erase Samantha Elliot’s record of 13.42 seconds. Her teammate Daszay Freeman finished second in 13.39 seconds for another Jamaican quinella. 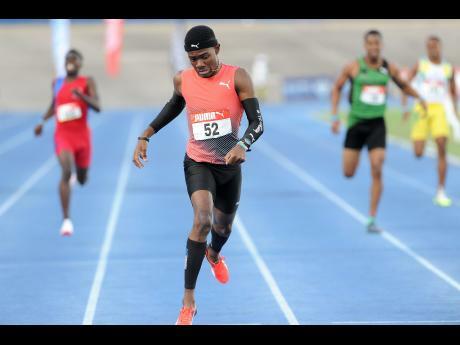 As was the case at Champs, the St Jago duo of Vashaun Vascianna and Jahvel Granville could not be separated in the Under-17 boys’ 110m hurdles, as Vascianna captured the event in a new record of 13.60 seconds, erasing the old mark of 13.75 seconds done by French athlete Wilhem Belocian, who represented Guadeloupe at Carifta. Granville finished a close second in 13.70 seconds. Defending Under-20 champion Orlando Bennett made it a clean sweep for Jamaica after clocking 13.35 seconds for the win. Williams stamped her class by securing the sprint double after clocking a personal-best 23.11 seconds to take home the Under-17 girls’ 200m title. Ockera Myrie won the Under-20 event in 23.34 seconds. Rajay Morris and Christopher Taylor won the boys’ events. Morris took the Under-17 gold in 21.25 seconds, with Andre Bent finishing second in 21.42 seconds, while Taylor topped the Under-20 field in 20.38 seconds, with Xavier Nairne grabbing the bronze in 21.07 seconds. Ackelia Smith, Zackery Dillon and Zico Campbell picked up gold medals in the field yesterday. Smith won the Under-17 girls’ triple jump with 12.58 metres, ahead of teammate Velecia Williams (12.31m). Dillon captured the boys’ Under-20 shot put with 16.40 metres ahead of Ralford Mullins (15.49m), while Campbell was victorious in the Under-20 boys’ shot put with 17.90 metres.